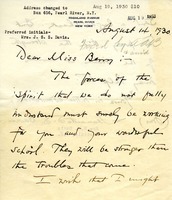 Miss Devoe sends a donation to Berry. 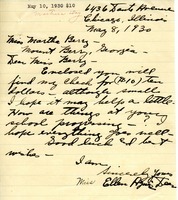 Miss Deer hopes her check, although small, will help Martha Berry through trying times. 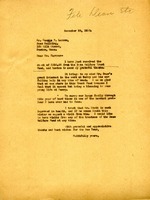 A small donation is sent to Berry. Martha Berry thanks Mr. Larcom for his donation which came from the Dean Welfare Trust. Mrs. Day wishes she could do more to help Martha Berry. 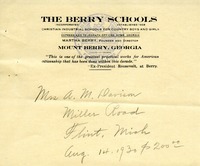 Mrs. Day sends Martha Berry a donation. Mrs. Davison follows up on her promise of sending funds for a scholarship. Martha Berry sends her thanks to Mrs. Davison for helping the Berry Schools in what ways she can. 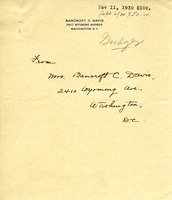 Mrs. Davison thanks Martha Berry for the Christmas gift she sent and encloses a check. 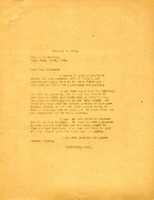 Mrs. Davis sends what she can to help Martha Berry with her wonderful work. 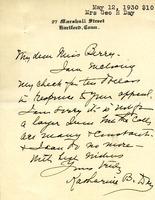 Mrs. Davis sends a donation to Berry. 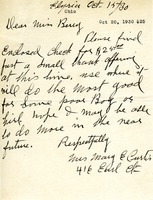 Mrs. Daland sends Martha Berry a donation. 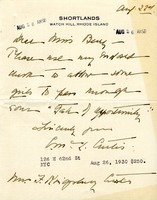 Mary Curtis sends Martha Berry a donation.